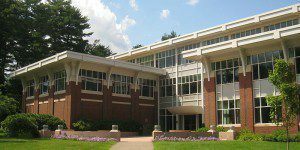 The Babson College Blended Learning MBA program at the F.W. Olin Graduate School of Business is geared towards students who wish to complete their MBA while remaining employed on a full-time basis. Students may begin the 21-month program in March or September. The program employs both in-person class time as well as online courses, and classes are offered in Wellesley, MA, and San Francisco. Approximately every seven weeks, students must complete an intensive, in-person session of class time spanning from Friday to Saturday, and the online portion of MBA coursework totals about 20 hours each week. For Babson College Blended Learning MBA students, two required residency weeks occur at the start and middle of the program on the main campus in Wellesley. The core curriculum is divided into seven parts and 14 courses, including Entrepreneurship and Opportunity, Financial Reporting, Data Models and Decisions, Law, Marketing, Global Connections Through Technology and Measuring and Managing Strategic Performance. Several Signature Learning Experiences (SLEs) are incorporated into the core curriculum, allowing students to apply the knowledge they have gained from courses in real-life business scenarios. Babson students complete the rest of the Blended Learning curriculum through electives, with two electives taken over two seven-week periods. Traditional electives are offered through the accounting and law, finance, economics, technology, operations and information management, entrepreneurship, marketing and management departments. Non-traditional electives consist of study abroad opportunities, research and team projects. Students may take courses abroad through Babson or a partner school, conduct research or participate in the Management Consulting Field Experience (MCFE) or Joint Management Consulting Field Experience (JMCFE). The Global Management Program also allows MBA candidates to work and study abroad. The final requirement in the program is the Corporate Entrepreneurship Capstone course, for which students work in teams in order to develop and implement a business idea. Students may complete their capstone in conjunction with their full-time employers by selecting an appropriate project within their companies or complete a greenfield project. For the most recent academic year, 134 students constituted the Blended Learning class. Students averaged nine years work experience prior to enrolling, an average GMAT of 598, and a GPA of 3.06. Forty-four percent of the class were women, 5 percent were international students, and 28 percent identified as members of a minority group. The average starting salary for recent Babson Blending learning MBA grads is $116,747. The overall cost of the Babson College Blended Learning MBA for students is approximately $92,564. Babson charges its Fast Track students by the credit at a rate that is determined each year by the school’s board of trustees. Applicants should submit their official academic transcripts, a $100 application fee, two letters of reference, a current résumé, GMAT or GRE scores, two essays and, in the case of international candidates whose native language is not English, TOEFL iBT, or IELTS test scores. Interviews are by invitation only. No GMAT score is necessary for acceptance into the program. All applications submitted after the final deadlines posted above are accepted on a rolling basis.